Skip the drive-through. 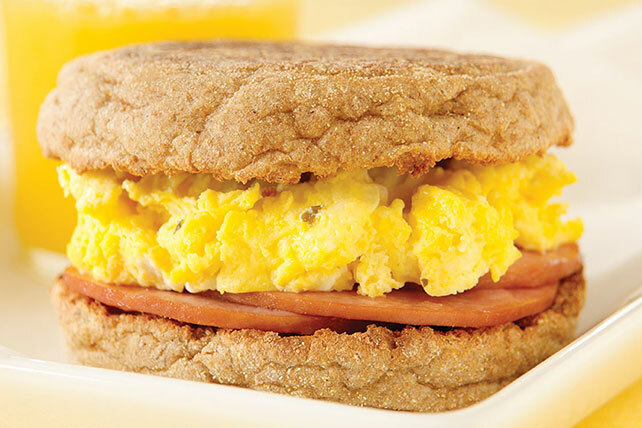 Make this Healthy Living egg sandwich recipe with ranch dressing and Canadian bacon on a whole wheat English muffin. Heat Canadian bacon as directed on package. Cover 1 of the muffin halves with Canadian bacon; top with egg mixture and remaining muffin half. Add 1 KRAFT Slim Cut Sharp Cheddar Cheese Slice to assembled sandwich before topping with remaining muffin half. Increase eggs to 4, dressing to 1/4 cup, Canadian bacon to 12 slices and English muffins to 4. Beat eggs and dressing with wire whisk until well blended. Spray medium skillet with cooking spray; heat on medium heat. Add egg mixture. Cook 3 min. or until eggs begin to set; stir. Cook an additional 2 min. or until eggs are thickened and no liquid remains, stirring occasionally. (Do not overstir.) Meanwhile, heat Canadian bacon as directed on package; cut each slice in half. Place toasted muffin halves, cut-sides up, on serving platter; top evenly with the Canadian bacon and eggs. Cover to keep warm. To make sauce: Combine 1/4 cup KRAFT Lite Ranch Dressing and 2 Tbsp. fat-free milk in small microwaveable bowl. Microwave on HIGH 20 sec. or until warmed. Drizzle evenly over sandwiches. Garnish with chopped fresh tomatoes and fresh parsley, if desired. Makes 4 servings, 2 topped muffin halves each.